C-Path's Polycystic Kidney Disease (PKD) Outcomes Consortium is a collaborative partnership whose research leads to discovery of treatments for PKD. The Polycystic Kidney Disease (PKD) Outcomes Consortium is a successful collaboration between Critical Path Institute (C-Path) and several leading academic medical centers, pharmaceutical companies, patient organizations, and international regulatory agencies. Its mission is to develop tools and processes, and promote research that will lead to the development and regulatory approval of new treatments for PKD, and improve the lives of all it affects. The consortium has successfully qualified Total Kidney Volume as a prognostic biomarker with both the US Food and Drug Administration and the European Medicines Agency. Currently, PKDOC hosts monthly teleconferences to explore alternative endpoints, innovative trial designs, and other topics of general interest to the participants. Attendees include pharmaceutical companies, academic organizations, foundations, patient advocacy groups, and regulatory agencies from around the world. Anyone who is interested may participate. Autosomal Dominant PKD (ADPKD) is a debilitating genetic disease affecting more than 600,000 Americans and 12 million people worldwide and for which there is currently no known cure or effective treatment. 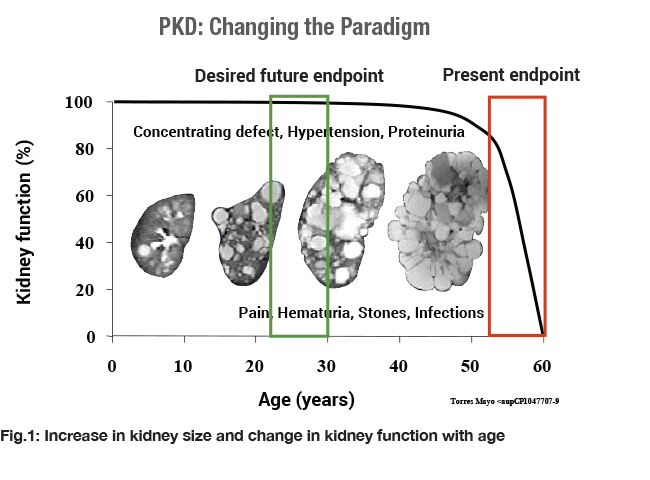 PKD is marked by a long period of stable kidney function (as measured by the currently accepted endpoints in drug development) during which the kidneys expand enormously due to cyst growth. 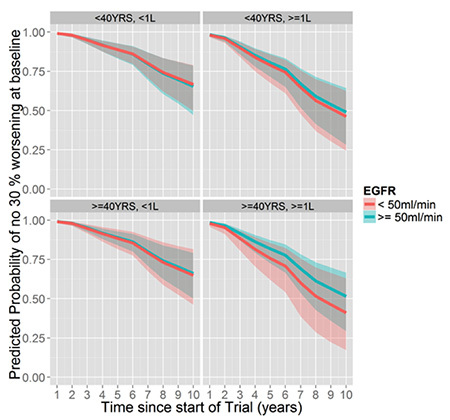 Traditional endpoints of renal function (serum creatinine levels) only show changes very late in the course of the disease, making it difficult to assess the effectiveness of new medications. There is critical need for a biomarker that will assess disease progression at an earlier stage before patients have incurred serious, irreversible damage and when they may be more likely to respond to new therapies. The initial goals of the PKD Consortium were to develop CDISC data standards for PKD and to use clinical data from ADPKD patients collected over many years in patient registries and observational studies to support the FDA and EMA qualification of an imaging biomarker, Total Kidney Volume (TKV), for use in drug development trials. These initial goals have been achieved. Total Kidney Volume is a measurement of the size of the kidneys and has been shown to be predictive of a future decline in kidney function. 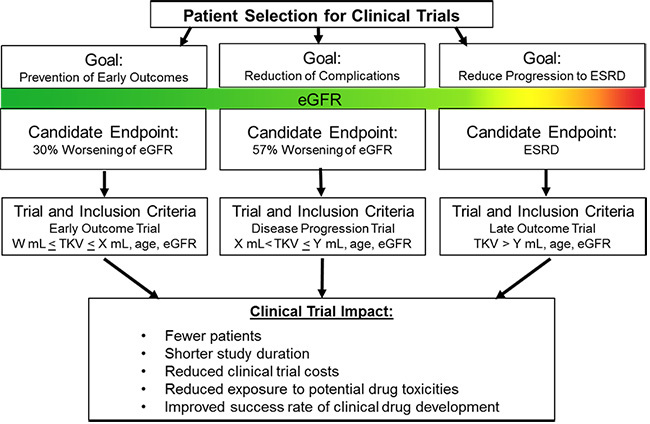 This draft guidance provides qualification recommendations for the use of TKV, measured at baseline, as a prognostic enrichment biomarker to select patients with ADPKD at high risk for a progressive decline in renal function (defined as a confirmed 30% decline in the patient’s estimated glomerular filtration rate [eGFR]). 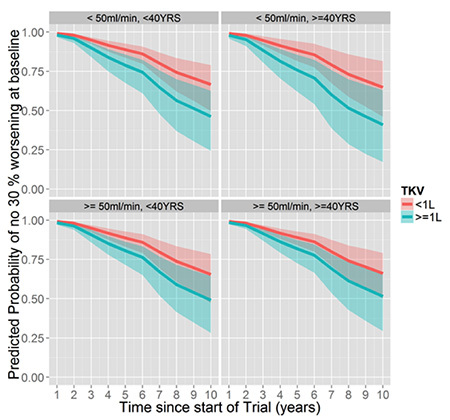 The use of TKV as a biomarker—along with the patient’s age and baseline eGFR—can help those conducting clinical trials in finding appropriate candidates, potentially improving the accuracy and efficiency of those trials. 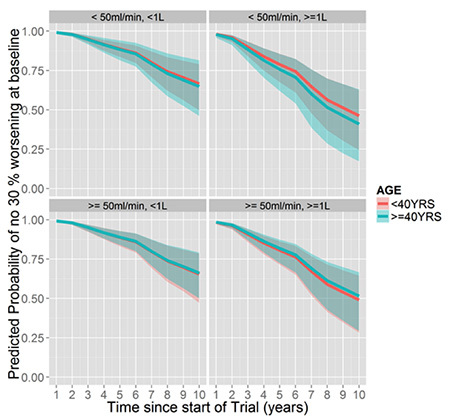 This set of graphs show clearly that patients with large kidney (greater than one liter in volume) have a greater likelihood of progressive kidney failure over time, regardless of age (younger or older than 40 years old) or baseline estimated Glomerular Filtration Rate (more or less than 50 ml per minute). This is a simplified flow chart that shows how TKV can be used for patient selection in various stages of drug development and the anticipated benefits.